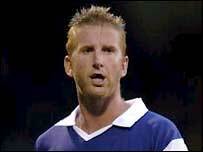 Gillingham player-coach Iwan Roberts is to appeal against a three-match ban for admitting he tried to injure Kevin Muscat when he was at Norwich. Roberts has also been fined £2,500 by the FA for comments in his book about a game against Wolves six years ago. But Gills chairman Paul Scally told his club's website: "If they have an issue with something Iwan has written they can punish him by fining him. "I see no justification why we should be punished when we weren't involved."